Information from careful measurements of the affinity of ribosome-associated proteins for GTP and GDP, and from structural analyses, suggests that elongation factor-G must assume three different structures during protein synthesis and that the ribosome itself acts as a guanine-nucleotide exchange factor. Is it time to re-write the textbook description of translation? All subcellular units of macro-molecular machinery are complex, and an article in Journal of Biology  suggests that the way that ribosomes operate is more complex than had previously been suspected (see 'The bottom line' box for a summary of the work). Many factors assist the ribosome with the business of knitting amino acids together according to the instructions within mRNAs, so as to form proteins. Up until now it had been assumed that a critical factor, the GTPase elongation factor-G (EF-G), enters the ribosome in GTP-bound form, promoting translocation of peptidyl-tRNAs through the ribosome, and dissociating from the ribosome following GTP hydrolysis (see 'Background' box for further explanations and definitions). But working at Uppsala University in Sweden, a group of researchers now claim that EF-G in fact binds to the ribosome in GDP-bound form and that the arrival of GTP drives the ribosome into a recently described intermediate state. 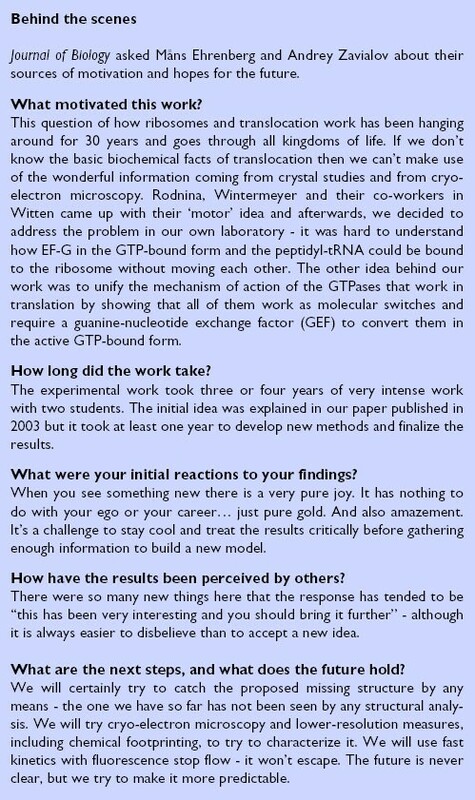 They also believe that a vital step in the way that energy is released from GTP molecules is stimulated by the ribosome, and not by some mysterious missing factor as was previously thought. Ribosomes are critical to every cell, and their structure and function are highly conserved in all organisms. They consist chiefly of two ribosomal subunits that clamp together like a clamshell, leaving a central channel through which mRNA is drawn. Alongside the channel are three distinct sites formed by the two subunits (see Figure 1). First is the aminoacyl (A) site, where free-roaming charged tRNA molecules, bearing their respective amino acids, bind if their anticodon matches the sequence on the mRNA. Further into the channel is the peptidyl (P) site, which is occupied by a tRNA that had arrived moments earlier and now holds not only its own amino acid but through it the nascent peptide. This growing peptide now attaches to the amino acid held by the newly arrived tRNA in the A site, and the tRNAs are drawn through the channel. The tRNA that had previously been in the P site is now in the exit (E) site, the third in the series, and when the process cranks again the tRNA will be ejected into the cytosol. The two-subunit ribosome with its three binding sites for tRNAs. See text for further details. This much is uncontroversial. The debate begins when you look in more detail. 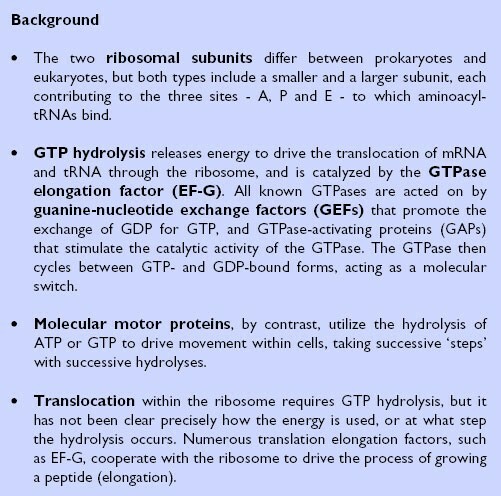 The translocation of tRNA and mRNA through the ribosome requires energy, and this is supplied by the hydrolysis of GTP to GDP. 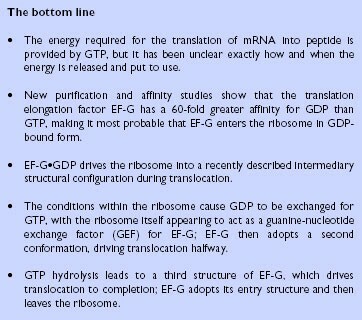 Most textbooks show GTP being carried into the ribosome attached to EF-G. Now, however, Andrey Zavialov et al. have shown that in the cytosol EF-G has a 60-fold greater affinity for GDP than GTP, so it is much more likely that EF-G carries GDP into the ribosome. Their study relied on complete purification of GDP away from GTP, whereas previous measurements have used GTP that contains some GDP contaminant (and vice versa). "It is almost certainly true that the preference of EF-G for GDP over GTP is much greater than the literature indicates, and hence that the concentration of EF-G•GDP in the cell is much higher relative to the concentration of EF-G•GTP than was previously thought," says Professor Peter Moore of Yale University, who has a particular interest in the structure and function of RNAs and ribonucleoproteins. Building on this finding, Zavialov et al. make another claim, although admitting that on this one they do not have 100% proof. "We believe that when EF-G•GDP enters the ribosome, this alone causes the ribosome to move into the hybrid configuration identified initially by Harry Noller," says senior author Måns Ehrenberg, who is Professor of Molecular Biology at Uppsala University (see the 'Behind the scenes' box for more of the rationale for the work). Noller, who works at the University of California, Santa Cruz, showed in 1989 that during translocation the tRNAs are bound in hybrid sites linking the A site on the small subunit with the P site on the large, and the P site on the small subunit with the E site on the large . Zavialov et al. believe that with the ribosome in this hybrid configuration something changes structurally that radically alters the relative affinities of GDP and GTP for EF-G, so that GDP is simply swapped for GTP. "The ribosome now helps EF-G to adopt its GTP-bound conformation," says Ehrenberg. In effect the ribosome has taken on the role of a guanine-ucleotide exchange factor (GEF) for EF-G. "I think that if this holds up it is really a novel discovery that EF-G in the GDP-bound form binds to the ribosome and the ribosome itself is the guanine-nucleotide exchange factor," says Simpson Joseph, who works on ribosome structure, function and dynamics in the Department of Chemistry and Biochemistry at the University of California, San Diego. "It was always a mystery how the exchange of GDP and GTP occurred, because there wasn't an obvious protein that facilitates exchange of GDP with GTP. It is interesting to think that the ribosome is actually performing this role," he adds. By the end of this switch from being bound to GDP to holding on to GTP, EF-G has assumed a new structural configuration. "When EF-G changes structure, the ribosome is going into some sort of transition state, which we have characterized biochemically, and it's a state just between pre- and post-translocation states," notes Ehrenberg. To study this, Zavialov et al. used a GTP analog that cannot be hydrolyzed and found that the ribosome could stay in this state for several minutes. In the normal situation, however, GTP is hydrolyzed, and EF-G now changes conformation to a third structure. "This is very important. It goes from a GTP-bound structure to a GDP-bound structure, but it is not like the free EF-G structure. Possibly this structure depends on the presence of the phosphate which still has not left EF-G after hydrolysis of GTP. This is speculation – but it may be the case," says Ehrenberg. This proposed third structure of EF-G has high affinity for the post-translocation ribosome, so that when the translocation process is completed EF-G remains attached to the A site of the ribosome until the EF-G resumes the GDP-bound structure it had when it first entered the ribosome. "We suspect that this third structure of EF-G is the one that is 'frozen' by the antibiotic fusidic acid, a classic tool in ribosome research," says Ehrenberg, who believes that when this antibiotic binds to the ribosomal complex it prevents EF-G from resuming its free GDP-bound structure and consequently stops it leaving the ribosome. The data presented in the article by Zavialov et al. therefore challenge the 'classical' model of translocation in which EF-G enters the ribosome in the GTP form, translocates the tRNA and mRNA and hydrolyzes the GTP so that the EF-G can leave. It also challenges the more recent ideas presented by Marina Rodnina, Wolfgang Wintermeyer and colleagues from the University of Witten/Herdecke, Germany. In their model, EF-G enters the ribosome bound to GTP, and soon afterwards GTP is hydrolyzed, releasing energy to drive the translocation; this model implies that there is some form of molecular motor protein inside ribosomes, perhaps EF-G itself . "This work and previous work by Ehrenberg's and [Joachim] Frank's labs point to a new way of thinking about the role of EF-G. Interestingly, most GTPases are switches whereas motor proteins are often ATPases, so their work would bring EF-G in line with most other GTPases," says Venki Ramakrishnan, a ribosome-translation expert at the Medical Research Council Laboratory of Molecular Biology, Cambridge, UK. In addition, Moore notes, "The model for EF-G action Ehrenberg and co-workers advance is consistent with their data, contradicted by no data that I know about, and does explain some observations made about the properties of EF-G in both my laboratory and Anders Liljas's laboratory (Lund University, Sweden), both published and unpublished, indicating that the conformation of EF-G•GTP in solution may be no different from the conformation of EF-G•GDP or free EF-G in solution. Furthermore, Zavialov and Ehrenberg's model is very different either from the classical model or from Rodnina's more recent model." As with many good pieces of work, this paper is controversial and consequently triggers the need for more research. "Their work contradicts findings from other well-established groups, and they also use a new method for measuring the movement of mRNA whose limitations are not clear. So their work needs to be confirmed by further experiments. Hopefully it will spur others in the field to confirm or disprove their findings," says Ramakrishnan. Ehrenberg is the first to recognize that some of the assays in his work are new, and that this always raises questions. Joseph notes, "In the biochemical data they show that with GDP alone they have only pre-translocation EF-G. That is very clear. But this is a new assay and while the assay is straightforward and there is no reason to assume a problem, it still needs to be proven." Joseph believes that it would be good to repeat the studies with some of the more conventional assays for translocation. Moore agrees on the need for further research. "Zavialov et al. present persuasive evidence that the effects of EF-G•GDP on translocation reported by Rodnina and co-workers were the result of GTP contamination in the GDP they used. All of their experiments need to be redone with rigorously purified GTP and GDP, and I hope they are stimulated by this paper to redo those experiments," says Moore. One of the main competitors in this field is less than enthusiastic. "To challenge established models is generally stimulating, and this is what the paper of Zavialov and Ehrenberg does," says Wolfgang Wintermeyer, but so far he is not convinced by the new evidence. The paper, he says, assumes that EF-G enters the ribosome in the GDP-bound form, but Wintermeyer believes there is no proof that EF-G cannot enter in the GTP-bound form. Thus, he claims, the kinetic analysis performed by Rodnina's group as well as his own for the situation when EF-G enters in the GTP-bound form, and the model derived from those results, still stands. "In fact, the kinetic analysis shows that GTP hydrolysis follows binding rapidly, indicating that very little time, if any, is left for nucleotide exchange prior to GTP hydrolysis, which is the major feature of the proposed model," says Wintermeyer. For Wintermeyer the weakest point of the paper is that it provides no kinetic data. "Thus, to assign the ribosome the function of a GEF appears to be premature and would require a more thorough analysis," says Wintermeyer. What Joseph advocates is for someone to repeat these translocation experiments using rapid kinetic methods with the GDP-bound and the GTP-bound forms of EF-G. Wintermeyer's and Joseph's queries arise because this new work gives no idea of the speed of the process. The experiments run for 10–30 minutes, giving plenty of time for either the GDP- or GTP-bound forms to catalyze translocation. "Without the time resolution we cannot know the magnitude of the defect if GTP is missing," says Joseph. In normal function, ribosomes operate at 15–20 elongation steps per second, with the rate-limiting step being getting the right tRNA into the A site. "I think it is a good thing for the field in that people will now look at it a bit more closely and maybe once it stands the test by several different groups that will be a great thing," says Joseph. But Moore cautions, "The new model will certainly elicit a reaction from the rest of the community, which is a good thing. The experiments everyone else does in response may prove that this model is right, but decades of experience in this field have taught me not to rush to judgment,".